A French drain draws water away from one area, such as the ground near a house foundation, to prevent water from causing damage to the structure. To do this requires a sloped ditch or trench with the high point at the area requiring drainage; the slope from end to end is generally 1 to 2 percent. A layer of gravel fills the bottom of the trench, with several inches of coarse sand on top of that. Some French drains have sod over the sand to make them less visible, and some include a drain pipe in the bottom to ensure the drain structure lasts. The gravel used on the bottom layer of the trench -- filling it one-third of the way if using a perforated pipe, or two-thirds if not -- acts as an underground path or waterway for flowing water. Gravel used for this layer is typically 1/2 inch to 1 inch across -- the larger it is, the better the water flow and less chance of clogs and blockages. For a French drain without a perforated pipe, opt for even larger gravel, such as 1 1/2 inches across. Smaller gravel such as pea gravel would not allow sufficient water flow. No matter what the gravel or stone, opt for washed varieties, otherwise fine dust and particles may hinder or even stop water flow. 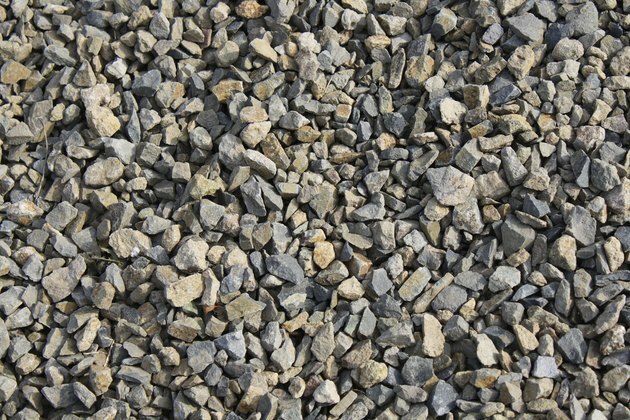 Hard rocks such as granite or river gravel prove viable options for a French drain because they won't break down over time as much as other rock varieties, such as sandstone and limestone. River gravel has already spent a good deal of time eroding down to its current size, as it is acquired from dried river beds before being cleaned and sold to the public. Coarse sand provides the filler for the top several inches of a French drain, whether you use a perforated pipe in the drain or not. Coarse sand doesn't clump or clog, and has been washed to remove impurities. Sod can be used on top of the sand, after placing a weed barrier cloth over the sand layer, or add decorative large rocks if you enjoy the look of stone and don't want to hide the drain completely. Using rock on top also guarantees you can find the drain next week or several years down the road to check how well it is working.